This should seem obvious, but far too many businesses fail to take their employees’ perspective fully into account in designing their office space. A recent CNN article highlights several studies exploring how employees evaluate workplace design. The first judgment starts before they are even hired. About half of applicants take the company’s office space into account when deciding whether to accept a job offer. A Center for Health Design study found that companies get a 6% increase in productivity for having a workplace with a good layout. Speed and accuracy also rise in work environments where employees have some say over their cubicle décor. Perhaps panel extenders can play a role in boosting positive employee response to a work environment. Imagine a candidate for a job visiting a workspace that has brightly colored or beautifully printed privacy panels protecting each workstation. Wouldn’t that make a better impression than an open office space with too much noise and low, drab cubicle walls? 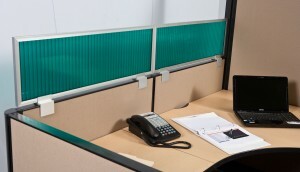 Even an office that doesn’t have the best layout might be improved by upgrading cubicles with panel extenders – especially for employees who want more control over the noise level and visual privacy around their desk. Do Your Employees Have a Bill of Rights?